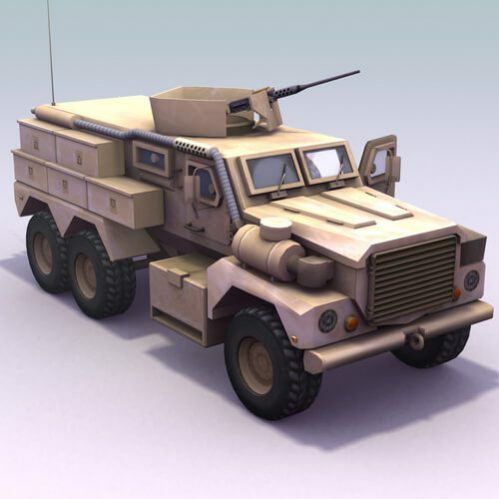 The U.S. military missions in Iraq and Afghanistan required a new kind of armored truck to keep American soldiers protected as they patrolled or traveled about hostile areas of these countries. Because of guerilla tactics used by insurgents against U.S. forces, particularly the widepspread use of cheap improvised explosive devices (IEDs), the Pentagon deployed thousands of mine-resistant, ambush-protected vehicles, or MRAPs. U.S. military purchasing or MRAPs ramped up significantly beginning in 2007. The large fleet of MRAPs that was eventually acquired by the U.S. Army and Marine Corps has been credited with saving some 40,000 lives over the last several years. MRAPs have provided protection superior to that offered by the Hummer, even after Hummers were uparmored better withstand blasts. Now, with the actions in Iraq and Afghanistan winding down, the U.S. armed forces are looking a vehicle more suitable to the kinds of missions that it expects to be confronted with in the future. With no plans to become involved again long-term occupations again any time soon, and the focus of military strategy shifting to the Pacific region, the Army and Marines want a vehicle that is less bulky and heavy than an MRAP. What the armed forces want is a versatile truck that’s nimble like a Hummer but that affords improved protection for its passengers. As a cost-saving measuring, the U.S. Army and Marine Corps are developing the next-generation troop transport truck together. The two branches’ joint light tactical vehicle program has gone through its technology development phase and has entered the engineering and manufacturing development phase. The goal is to have 22 prototypes produced within the next year. Old MRAPs may be retrofitted for other uses, or sold or given to foreign fighting forces as U.S. military aid. However, some military watchers are advising the Pentagon to keep a fleet of both MRAPs and Hummer around in case those vehicles’ capabilities are needed in the future. The Armored Group has built armored military vehicles for the U.S. Army and for major U.S. military contractors. Find out more at military vehicle, and also check us out for armored sedans and SUVs, limousines, law enforcement vehicles and cash-in-transit trucks. We also stock a variety of used armored vehicles at prices lower than new. Call The Armored Group at 602-840-2271 to discuss your security needs with our experienced professionals.